The ISPCC is delighted to announce that Bailieborough Community School has been presented with an ISPCC Shield Flag for its exemplary actions taken to combat bullying. 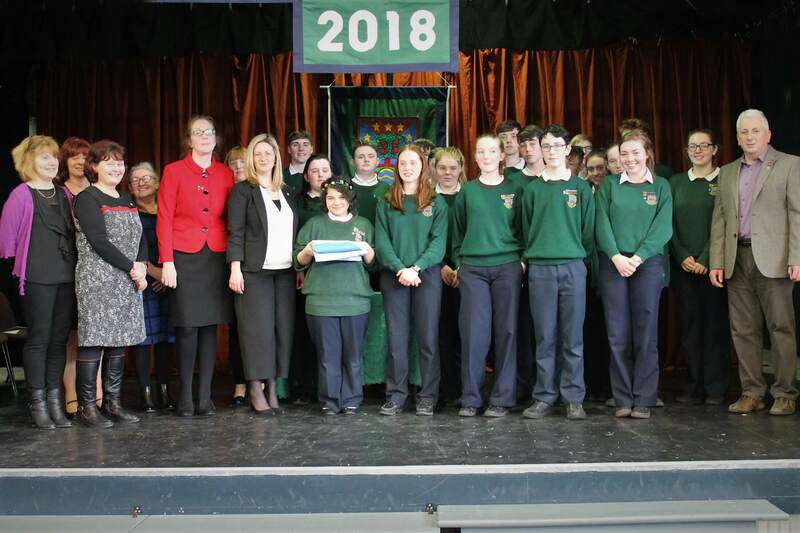 Bailieborough Community School received its Shield Flag on Friday 23rd February 2018, following its completion of the ISPCC’s Shield Programme. The ISPCC’s Shield Programme is how the ISPCC supports schools, clubs and communities to tackle and prevent bullying. Shield resources provide schools with an effective programme to tackle bullying and provide young people with the necessary coping skills to deal with and protect themselves from bullying. The Shield Flag is the pinnacle achievement of the programme and is presented to clubs, communities and schools, such as Bailieborough Community School which has applied particular effort and dedication to combating bullying. 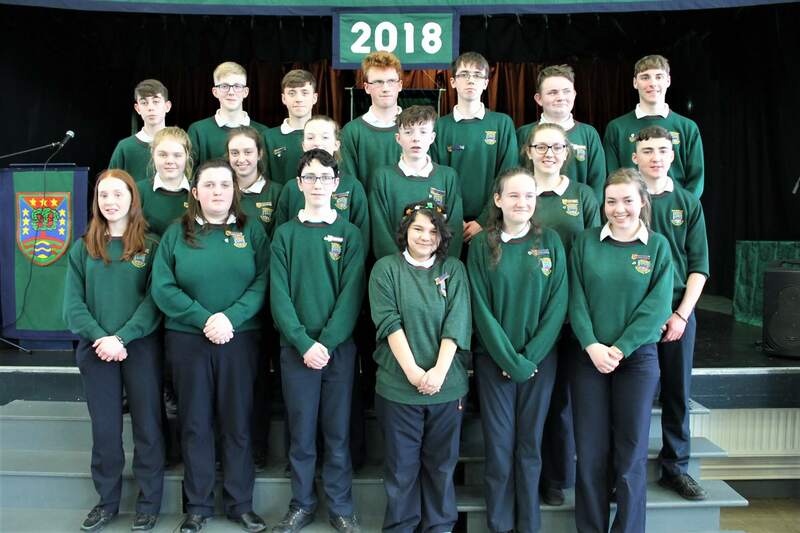 The students of Bailieborough Community School demonstrated their commitment to combating bullying in their Shield Flag presentation event, which took place at their school on the morning of Friday, February 23rd. Students from First, Second and Third Year as well as Student Council Members were involved in the celebration, with performances of a roleplay, a recitation and a rendition of ‘Fight Song’ among the highlights. The power of the bystander and the importance of hope were also reflected upon. 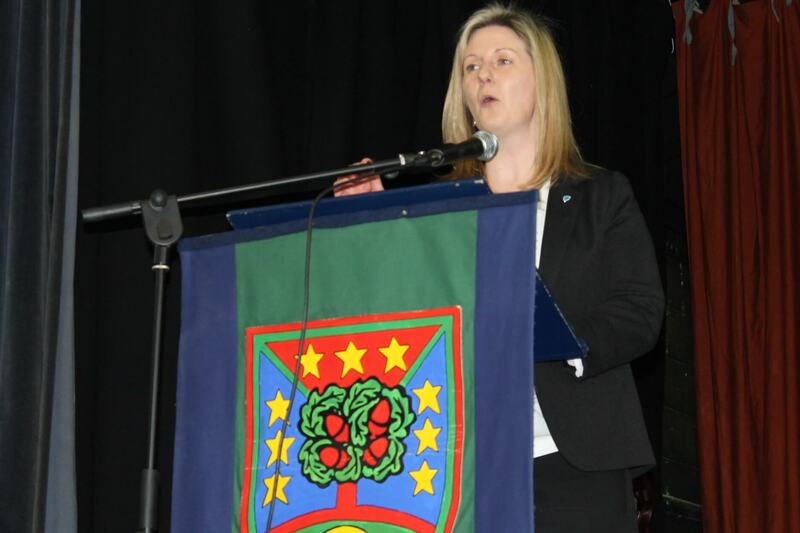 ISPCC CEO Grainia Long congratulated all in attendance for the role they had played in helping to foster a spirit of inclusion, respect and friendship in the school and on their achievement of attaining a Shield Flag. Bailieborough Community School worked closely with Bounce Back Youth Service, Cavan, in maintaining an ethos of friendship, respect and inclusion in their school. Bounce Back Youth Service is a rural resilience project, launched in 2017 by the ISPCC and Youth Work Ireland, which reaches out to young people aged between 10 and 24 years in rural areas of County Cavan. Members of the Bounce Back Youth Service team completed programmes with pupils in Bailieborough Community School over the past year, with many pupils in turn going onto become members of the Children’s Advisory Committee with the ISPCC in Cavan. Pupils in Bailieborough Community School have been referred to avail of the services offered by Bounce Back, which include a detached youth work programme, youth café and other youth programmes. Congratulating Bailieborough Community School on its achievement of attaining an ISPCC Shield Anti-Bullying Flag for their school, ISPCC CEO Grainia Long said: “you have shown great leadership in County Cavan by being so proactive in stamping out bullying. Regrettably, bullying is an issue which continues to affect significant numbers of children and young people in Ireland – Childline received about 18 calls in relation to bullying every day last year. We at Childline see how this type of behaviour can have a detrimental effect on young people’s lives, their self-esteem and their ability to grow. All of us can play a part in helping to ensure young people do not have to experience this. 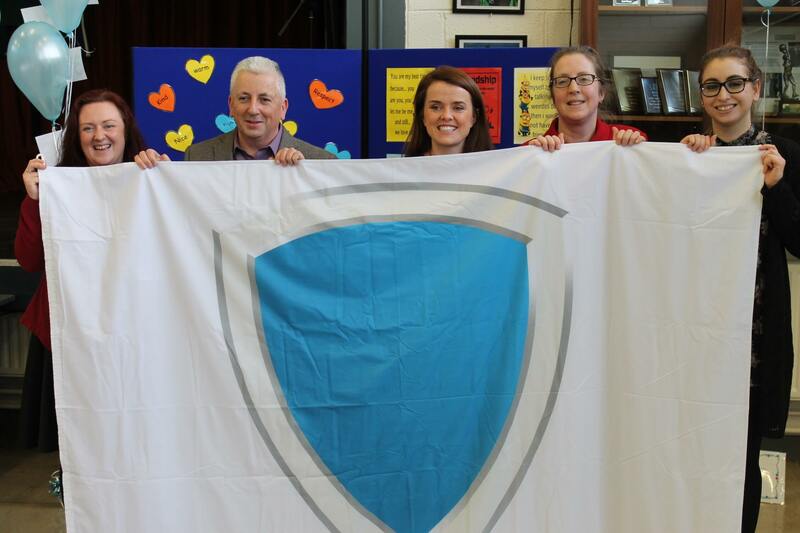 Bailieborough Community School Principal Martha Lievens said: “The ISPCC’s anti-bullying Shield Flag is something our school has been working towards for a while and looking forward to for an even longer time. Wherever groups of young people gather, there is potential for bullying. Our mission, as teachers and leaders, is to strive to ensure Bailieborough Community School is a safe and friendly place for all of our students. The ISPCC’s Shield Anti-Bullying Programme, coupled with the time, effort, vigilance, sensitivity, courage, honesty and dedication of our teachers, tutors, year leaders and assistant year leaders, has significantly assisted us towards achieving that mission.” Key players in getting us to this day are our Personal Safety Co-ordinator Siobhan Corrie, SPHE Co-ordinator Mary Mc Mullen, Student Council Co-ordinator Clare O’Reilly and our wonderful Care Team of Alison Holton, Leanne Monaghan and Kate Collins. Schools, clubs or communities interested in finding out more about the Shield Programme can read more at ispcc.ie/shield.